January 1, 2018 – Happy New Year, history lovers! 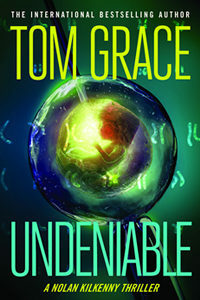 To kick off 2018, we welcome thriller author Tom Grace to discuss the sixth novel in his series featuring ex-Navy SEAL Nolan Kilkenny: Undeniable . Tom’s novels feature cutting-edge technology, and we discuss how DNA science is solving historical mysteries. Did Adolf Hitler have a son? Was Warren G. Harding our first black president? What sinister uses will criminal minds cook up when editing DNA is as easy as editing a Word document? Ancestry.com is set to double their database to 12 million people in the New Year. Our trained genealogist can help you unlock the history written in your chromosomes at HistoryAuthor.com/Family-History. Find Tom online at TomGrace.net, on Twitter @Tom_Grace, or like him as Facebook.com/AuthorTomGrace. All his novels are available in paperback from Regnery Fiction. Tom has guest hosted on the History Author Show three times. Jeanne Walker Harvey: Maya Lin: Artist – Architect of Light and Lines. Hugh Howard: Architecture’s Odd Couple: Frank Lloyd Wright and Philip Johnson. Gerald Posner: God’s Bankers: A History of Money and Power at the Vatican. Our next all-new interview airs on January 15, 2018 as we move to an every-other-week schedule.